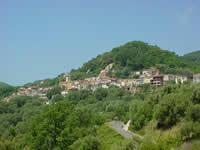 San Mauro Bruca is on a small hill between the rivers Lambro and Palistro in Cilento. 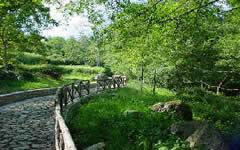 It is part of the Park of Cilento and Vallo di Diano and the Community Area of Montana Lambro and Mingardo. The name comes from its patron saint, the abbot Mauro who lived at the time of St. Benedict and his disciple was Subiaco. The final part of the country's name "Bruca" is probably a name of Greek origin. There are no certain information on the foundation of S. Mauro la Bruca, while its fraction S. Nazario, it needs to Richer, Abbot of Montecassino, around the XI century. To visit the church of S. Nazario. The monastery of St. Nazario was founded by Italian-Greek monks before the 1.000. Very interesting is the Cathedral Church St. Mauro, late Baroque style. The ancient church of St. Eufemia was built on the place where it is today the current church, it opened in 1885. From the church, demolished to make room for the new, advancing only the presbytery with frescoed dome. The presbytery of the church is now in the lateral cappella church, which is venerated wooden statue of St. Mauro Abate. It's possible admire the bell tower located at the center position in the country that spans the Gulf of Cape Palinuro. Very beautiful palace baronial De Cusatis is located in the historic center of St. Mauro the Bruca. The special geographical position allows you to admire the landscape of the Gulf of Palinuro and Mount Bulgheria. The town of San Mauro La Bruca covers 1893 hectares of land, largely covered by forests of chestnut trees, olive trees for centuries, oaks and Mediterranean where you can make suggestive walks.